The Onion's staff stuck to their cheapskate alt-weekly roots while other sites adopted go-go dotcom thinking. (Business 2.0) -- The claim sounds almost outlandish enough to be a headline on the Onion: "Satire Web site Shows Profit." But it's true, and the site it describes is none other than TheOnion.com, the scathingly funny lampoon of current events and news coverage thereof. For seven years TheOnion.com has been calling out the absurdities of our world -- "Executive Quits Fast Track to Spend More Time With Possessions" -- and has built a fanatical readership of 1.3 million a month. Beneath the mordant wit, the Onion has also built a solid business that survived the dotcom crash. When the online advertising collapse drove other ad-supported content sites into oblivion (remember Word.com or NBCi?) or forced them to experiment with subscriptions and premium pricing (� la Salon and TheStreet.com), the Onion managed to stick to its original business model and weather the tough times. Of course, it had help: The Onion grew out of a weekly alternative newspaper of the same name and was able to fall back on the revenues from that and a successful line of books during the direst stretch. Thanks to a management philosophy that owes more to its cheapskate alt-weekly roots than to go-go dotcom thinking, the Onion in all its forms now generates $7 million a year in revenue and a small profit. The Onion has come a long way since its founding in 1988. Back then, Tim Keck and Chris Johnson, two University of Wisconsin juniors, took an $8,000 loan from Keck's mom and launched the Onion with a couple of friends as a free humor rag published in their dorm. The paper made money in its very first year, and Keck and Johnson, perhaps thinking their luck couldn't last, quickly cashed out. In 1989 they sold the weekly to two of their Onion colleagues, Scott Dikkers and Peter Haise, for $19,000. By 1994 the paper was a local hit, reportedly generating $1 million a year in ad revenue and a few hundred thousand dollars in profit. Still, the publication remained a Midwestern secret until 1996, when it launched its site and instantly gained international recognition. One headline in particular, "Clinton Deploys Vowels to Bosnia: Cities of Sjlbvdnzv, Grzny to Be First Recipients," got the site the kind of attention you can't pay for. The spoof was passed around the Net like a virus, and the guys at NPR's Car Talk also picked up the story and read it on the air in its entirety. The Onion's reputation was made. Yet even after the Onion hit it big on the Web, the company stayed low-key. The writers still dreamed up their headlines (at the Onion, headlines come first) in a Madison, Wisconsin, office building and earned about $25,000 a year. One former Onion writer, Dan Vebber, who now works as a TV comedy writer in Hollywood, says money was never what motivated the staff. "There was something about growing up in the Midwest in blue-collar families that made us all pretty stunned we were able to make a living putting words on paper," he says. "To this day, I think a lot of the writers are still shell-shocked they are getting paid to do something they love." The company's diversified model has helped it survive the dotcom collapse. Its annual revenues are now $7 million. 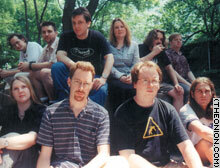 Things began to turn around in the fall of 2000, when, under pressure from the writers, the company moved to New York. There the Onion found a new investor: David Schafer, a businessman who had managed the $2.5 billion Strong Schafer Value Fund. 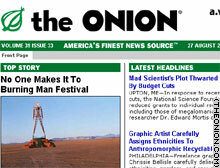 "The Onion's strong point was never accounting, financial management, or business," Schafer admits. "Buying it was a bit of a shot in the dark, but we felt we could get a handle on it." He did that by bringing on Sean Mills, who had run an interactive advertising agency in San Francisco. The first thing the new president did was revamp the ad-sales strategy. During the dotcom boom, ads flowed into the Onion without much coaxing from sales reps. But the flow had stopped, so Mills sent reps out to build relationships with ad agencies. That change and a new willingness to accept rich-media ads have helped the Onion replace fallen dotcom advertisers with such blue chips as DreamWorks, HBO, Nike, and Volkswagen. The strategy worked: The Onion is profitable again, although publisher Chris Cranmer admits no one's getting rich. "It's really the middle ground," she says. "We get to make a decent amount of money but have a large amount of happiness." With Schafer's continued backing, Mills expects to grow the company about 25 percent a year for the next five years. There's talk of adding new paper editions in San Francisco, Minneapolis, and Boston. Also in the works is an Onion movie, written by the staff and set to be produced by David Zucker of Naked Gun fame. And while the Web site's weekly review of the news will remain free, a premium subscription service is in the works to give die-hard readers an extra helping of Onion humor. The Onion is still cranking out headlines like "Israelis, Palestinians Agree to Share Headline." But Mills isn't looking to transform the Onion into a ubiquitous brand. He's protective of its subversive cachet -- one reason Jay Leno won't be doing a recurring segment called "News From the Onion." Last fall, The Tonight Show's producers called to offer the Onion a regular slot, but "we just didn't feel like it was the right place for us," Mills explains. That's not the first such offer he's waved off. "Most of my job is to say no to potential deals," says David Miner, an agent who represents the Onion. "It's OK if I never make a nickel on them, so long as I'm not the guy who killed the brand." The looming fear, of course, is that the brand could languish if the commentary doesn't stay relevant and funny. "It's definitely getting harder because we try not to repeat ourselves," says editor Carol Kolb. As demonstrated by the failure of Spy Magazine and National Lampoon, humor publications have historically had trouble staying hot for long periods. But 15 years in, the Onion is still cranking out headlines like "Israelis, Palestinians Agree to Share Headline," and against all odds, the operation just keeps growing. To paraphrase Steve Martin, comedy isn't pretty, but it's not a bad way to make a buck.